Each organization structure has its own set of advantages and disadvantages. The advantage of functional organizations is that resources may find clearly defined career paths and achieve specialization and skill development in their respective fields. It will be a flexible work force since only one manager will be responsible, avoiding confusion. 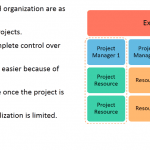 The disadvantage of such organization type is that project work is hampered. Department work is always given higher priority than the project work. 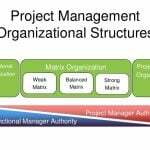 In addition, there is no career path in project management, which leads to lower interest in projects. In the case of the projectized organization, one of the clear advantages is better communication within the projects. Since project work is the only work team members are doing, it also leads to loyalty towards the project goals. 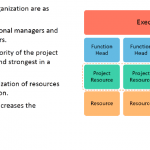 The disadvantage of such organization type is the inefficient use of resources, because every project team has their own support function. Therefore, this might lead to the duplication of effort. It also leads to the resources being left with no work, since their roles are over once the project is completed. 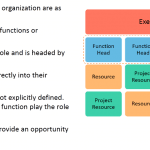 It also hampers skill development because the project requirements dictate what kind of work team members perform at different stages on a project. Now, let us look at the matrix organization. It also has the advantage of better coordination and maximum utilization of resources. However, the disadvantage is the higher potential for conflict among the managers, which might lead to communication complexity and overhead management.